The government has set ambitious targets through 2030 that include reductions in greenhouse gas emissions and energy consumption. 0.048 grams of gold, 0.26 grams of silver and 12 grams of copper1; the metals recycled from a typical mobile phone that are helping to create approximately 5,000 medals for the Olympic and Paralympic Games Tokyo 2020. Over 80,000 mobile phones and other small electronic devices have already been donated directly to the Tokyo Metropolitan Government (TMG) building alone, with the organizations involved hoping it will make the nation feel like active participants in the Games. This effort is just one small part of TMG’s own challenge to become a more sustainable city for Tokyo 2020 and beyond. Tokyo last held the Games in 1964, with the Shinkansen bullet train, its highway system and other infrastructure improvements creating a legacy that became drivers of Japan’s economic growth. Today, the city is focused on leveraging the Tokyo 2020 Games to further itself as a model sustainable society, using the event to usher in economic growth, environmental conservation initiatives and improved quality of life through new innovations. As you’d imagine, the work doesn’t stop when the Olympic and Paralympic flames are extinguished. The government has set ambitious targets through 2030 that include reductions in greenhouse gas emissions and energy consumption. With climate change looming as a major risk to the world, the metropolitan government believes it’s essential to shift to a low-carbon society. In line with the Paris Agreement, TMG has set a 2030 target for a 30% reduction in greenhouse gas emissions from 2000 levels. In 2010, Tokyo introduced the world’s first urban cap-and-trade program for large facilities, including office buildings. During the Games, the city plans to utilize these carbon credits that are generated from the program to reduce CO2 emissions to zero during the four days of the event’s opening and closing ceremonies. TMG also hopes to utilize AI, the Internet of Things (IoT), and advanced environmental technologies to achieve a zero emissions city in the future. 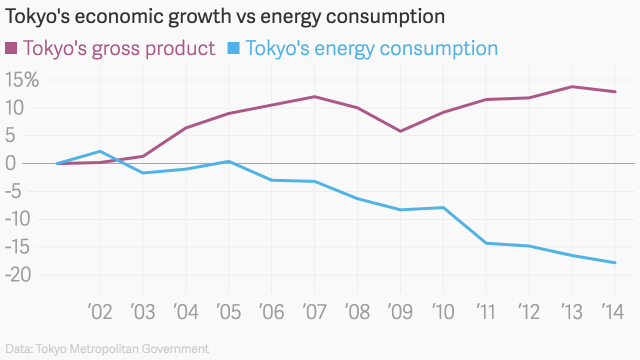 Tokyo is also pursuing solar, wind, and other renewable energy sources to produce CO2-free hydrogen. TMG plans to take the lead in turning the Tokyo 2020 Games’ Athletes’ Village into a pioneering low-carbon area that uses hydrogen. For the rest of the city, they also plan to introduce more fuel-cell vehicles and establish a network of hydrogen fuel stations by 2030. 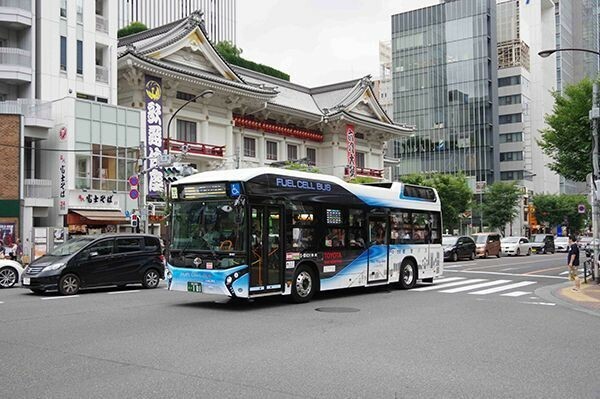 Fuel-cell buses are already being utilized for public transport in Tokyo, connecting Tokyo Station to the Tokyo Big Sight convention center. Renewable energy use accounted for just 11% of total electricity usage in fiscal 2015. The city aims to increase that figure to around 30% by 2030. Reducing energy consumption overall is also essential. To this end, among other energy initiatives, Tokyo is promoting energy saving programs for buildings in the city. 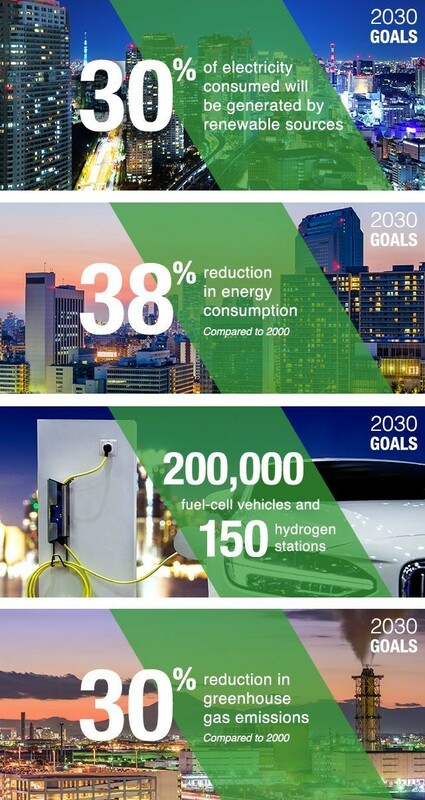 TMG has also set a target of a 38% reduction in energy consumption compared to 2000 levels by 2030. Tokyo is already an economic powerhouse, with a gross product of around US$850 billion annually that helps drive the world’s third-largest economy. However, as it grows economically, it must also focus on environmental sustainability. Since 2001, the city has been able to increase its growth while reducing energy consumption. Continuing this trend will be a key policy initiative for the future. Tokyo is, at its core, a concentration of people, infrastructure, information, and capital, attracting companies from around the world with leading-edge technologies in a range of sectors–from environmental technology to fintech, AI, and IoT–that help contribute to the city’s improved sustainability. One such company is Sensus Japan, a subsidiary of the US-based Sensus. A global leader in smart metering, network communications technologies and data analytics for utilities, they have expanded in Tokyo with the help of TMG’s business consulting program. The introduction of smart meters not only contributes to energy savings, but can also be applied to monitoring services that can help check in on elderly family members, as well as help establish more flexible payment plans in the retail electricity and gas markets through the utilization of big data. Sensus Japan indicated that it hopes to provide smart infrastructure solutions throughout Tokyo–as well as the rest of Japan–to help reduce energy consumption, and help people save time. The company also stated that it wants to work to help improve the quality of the city overall. As the growing number of overseas visitors know very well, Tokyo is more than just a center of business. Lush mountains that surround the region are just an hour away from the skyscrapers that characterize the city center. Nearby islands within the Tokyo Metropolitan area can also be reached by plane in less than an hour and offer fantastic views. TMG plans to introduce new mobility services and other types of next-generation transport infrastructure for visitors that will allow easy access to the islands. The city is steeped in four centuries of tradition and continues to utilize its many assets while continuously incorporating cutting-edge technologies. Looking ahead to the Olympic and Paralympic Games in 2020 and beyond, Tokyo intends to continue evolving with a view to becoming a more sustainable city and an inspiration to the world. Discover more about life in Tokyo here.